Save time and cut costs with this Solut 91088 10 oz. 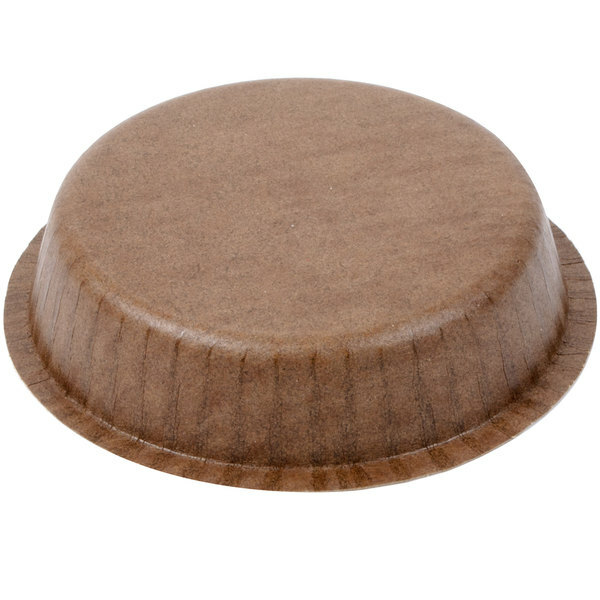 coated kraft baking cup with flange! This disposable, 10 oz. baking cup provides a sustainable, cost-effective alternative to foil or plastic baking cups. Constructed from durable, sustainable, SFI certified domestically produced solid board, the disposable baking cup is strong enough to handle a variety of freezer to oven functions and individual portion items. 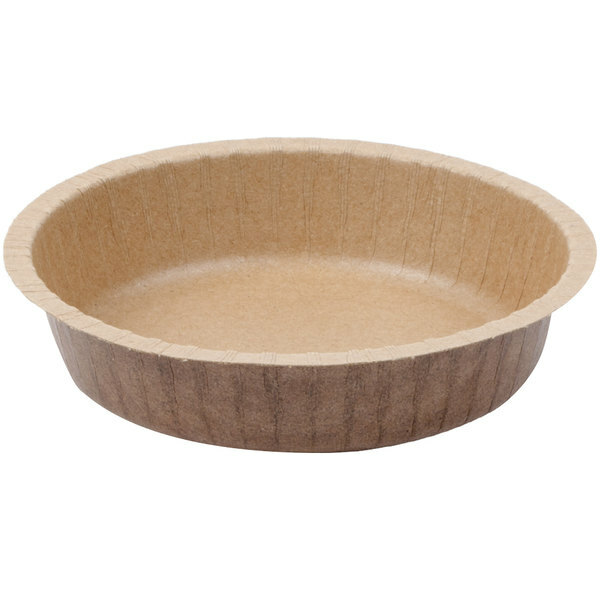 Made of 95% recycled content, this baking cup is certified as fully recyclable! Dual-ovenable up to 400 degrees Fahrenheit for up to 1 hour, this baking cup is microwave and oven safe, making for a versatile and convenient kitchen accessory! This is the perfect option for bake and display applications. This baking cup's quick release coating provides a barrier that resists moisture and grease, offering excellent release of cakes, brownies, tarts, cornbread, and other treats with a higher sugar and lower fat content. Simply dispose of the baking cup once you are complete! No clean up costs means more money in your pocket and more time in your day! The baking cup's earthy, kraft finish communicates eco-conscious service and offers a distinctive backdrop for individual portion items like small cakes, pies, or side dishes. This 10 oz. coated kraft baking cup is a durable, functional, and money saving packaging solution for all of your baking needs! This item has been certified by the Sustainable Forestry Initiative (SFI) to promote sustainable forest management. This item is certified Kosher Pareve by the Quality Kosher Supervision organization. These bowls were great. I didn't used them for cooking but for dips on an appetizer tray. They held up and didn't bend, and were great visually as well! Not very happy with these baking cups. They didn't feel very stable when they were filled, not a good thing especially when hot. They also emitted a strange odor that was very off putting. Thank you for your review, Paula! We are sorry this Solut 91088 10 oz. Kraft Paper Baking Cup with Flange and Quick Release Coating - 50/Pack has not worked well for you. A Customer Solutions Representative will contact you soon! These are wonderful little baking cups! I used them for mini cookie cakes for Valentine’s Day and they made perfect little gifts! Will use again! This product is great for holding many baked goods and treats. They hold up very well in the oven and look great too. Love this product! 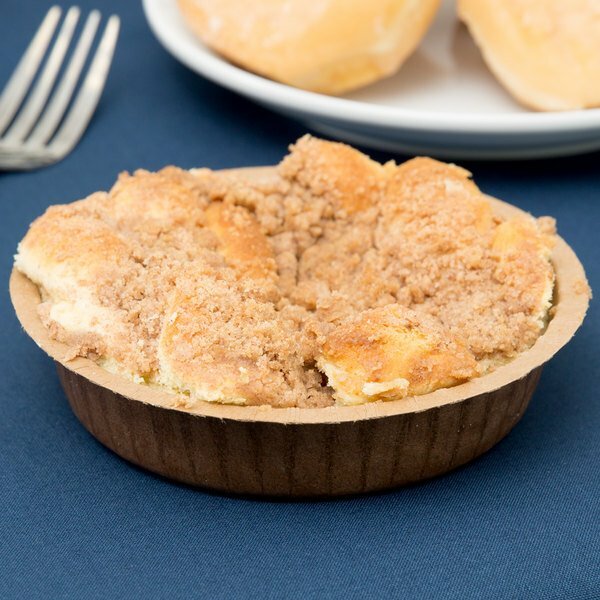 We use this Solut flanged kraft baking cup to make individual servings of our apple crisp recipe. Just the right size. And this is a bake and serve cup so this is a more efficient and practical way to do it. The cup is sturdy and bakes well in the oven. And it looks so nice for serving. This has been a good buy. these are perfect for a lot of things I bake, little pies, cookies, cinnamon rolls--a good weight and lots cheaper than those flimsy ones you buy in the store. Used these for apple crisp and they held up well. They do get a little "floppy" after storing for a few days in the cooler. We use these to make small serving sizes of cheese cakes, cookies for 2 and even individual coffee cakes. They handle the oven well and look great on display. We use these for our homemade chicken pot pies and small sized fruit pies. They are the perfect size and allow our customers to take their item and reheat it later in the microwave. These baking cups are fantastic! Love the selection of sizes, these work great for prepping & reheating items, great presentation & durability. Great price per unit.